The son of a Cowboy legend may be a big asset going forward. Wyatt Sheets picked up a big win in sudden victory over 16th-ranked Josh Humphreys when the Cowboys wrestled Lehigh in Gallagher Iba ten days ago. He picked up another big tech fall over Alex Mossing in the dual vs. Air Force. In an interview afterwards, John Smith seemed to indicate that Sheets would be the guy going forward and into the postseason at 157. So I thought it would be good to take a look at Wyatt and how things could play out with him and the Cowboys going forward. In the past few years we have had Barry Sanders, John Smith, and Bryant Reeves’ kids as athletes on the Oklahoma State campus. Wyatt Sheets shares a common bond with that group as his dad Mike is an absolute legend in the sport of wrestling and at Oklahoma State. Mike was a two time NCAA champion and the outstanding wrestler at the 1983 NCAA tournament. As the video indicates he was a pretty highly-rated recruit. A four time state champ out of high school and an All-American, he definitely had some big expectations out of high school. 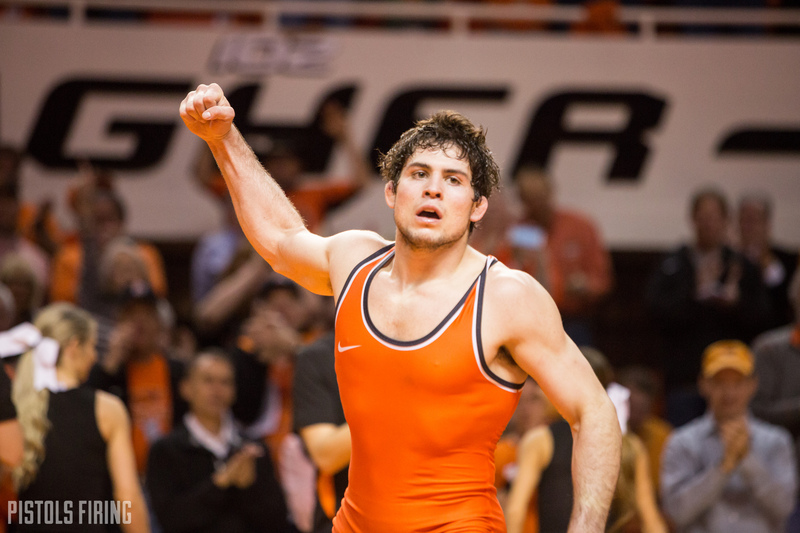 FloWrestling ranked him 52nd in his class. Just like his dad, he’s a hammer on top that has always had an ability to turn and pin guys. He dealt with some injuries and other things early in his career that hobbled him a bit, but we seem to clearly be seeing him blossom into a star in his redshirt sophomore season. Sheets is not a freshman. He’s a redshirt sophomore. He may be getting a year back though. After his injury last year, OSU requested an additional year for him and he may get it. Based on the matches he wrestled before his injury and the number of matches in last season, I believe he should qualify. It’s still up in the air though. They have not made a decision on it yet. If he can get that, he’s essentially in the same class with Kaden Gfeller and Daton Fix and all three will have four years remaining. If he continues to do what he’s been doing recently, that’s a pretty stout three-headed monster to lead the charge for the future of this program. You’ll want to pay close attention to if this extra year happens for him. Overall the recent development of Sheets as a bigger piece of the roster is a very positive thing. There was a bit of a three way race for this spot all season. Ultimately I think all three were/are pretty solid. But Andrew Shomers was cutting a lot to make 157 and looks like will be at 165 going forward, he told the staff he wanted to move up mid-season. And Jonce Blaylock is a senior and graduates in May. So get used to hearing Sheets’ name. There’s a good chance he’ll be the guy at 157 next year and maybe into the next few seasons.